Autosport has an interesting interview with Renault's technical director, Bob Bell, in which he states that the team need "a tidal wave" of change if they are to get back on terms with the top teams. No arguments from me on that score; I tend to agree with Alonso when he estimates that Renault are now the eighth fastest team. But something else Bob said caught my eye. Do you remember the J-damper system that surfaced in the WMSC's ruling on the Renault industrial espionage case? At the time, it was said that the Renault engineers had studied a drawing of McLaren's J-damper and queried its legality with the FIA. In spite of the echoes of the movable floor controversy, no great fuss was made of this - instead, the FIA decided that it was of no importance because Renault had failed to understand how the damper works. No wonder Renault are having such difficulty designing a competitive car when their engineers cannot grasp a new concept, even with a diagram of it in their hands. It is quite surprising that Flavio did not send them all back to school after that humiliating little exercise. But the really interesting matter is that the magic J-damper has surfaced again. Bell reckons that one of the team's improvements due for Barcelona will be a J-damper system. So perhaps I am wrong and the Flav really did send his guys back to engineering college - it seems they have managed to understand the thing at last. Which is just as well, really, since it now appears that several of the teams have their J-dampers in place and are running them already. That would include McLaren, Ferrari, BMW and Red Bull. So it would seem that the engineers at Ferrari, BMW and Red Bull did not even need a copy of McLaren's J-damper to get their heads round the idea. Obviously, we are talking a superior breed of engineer here. I am left wondering how Renault ever managed to win their two championships with staff so clearly incompetent. Or am I not giving Alonso and his six tenths credit enough? Perhaps, although it seems incredible that he would have managed to get a car designed by such duffers into race-winning situations. A more likely explanation would be that the WMSC fudged the issue in the first place, aware that Renault must be excused their efforts at industrial espionage, and that the incomprehension business was invented on the spur of the moment. Any detail of the Renault explanation of J-dampers could be picked on with the words, "Ah, they didn't get that quite right." There is no point in re-hashing the strange events of those WMSC hearings last year; what is done is dung, after all, and the F1 world has found a new political explosion to hold its attention. 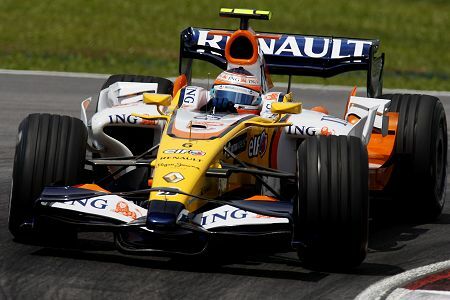 But I do want to point out that it is rough justice that Renault should be struggling in 2008. They are late in implementing a J-damper system purely because they chose to examine Mackereth's McLaren documents so closely; had they not queried the J-damper in the first place, they would have been free to develop a system of their own quite quickly. Instead and to avoid suspicion of profiting from the documents, they have had to hold fire on it until nearly everyone has J-dampers. I do love a bit of irony, don't you? This seems like kindof a stupid question, but what is a J-damper? Ok, you may be right but I will push irony a little step forward... What is an incredible and no justice at all, no matter how you see it, is that almost all the teams have developed a system which is clearly the same concept of mass damper banned in 2006. It may be different how it works but they're the same at the end, you try to minimize the variation of the angle of attack of the front wing, and you can do it using springs or you can do it with counterweight. Which is the difference that makes legal the current system (using springs) is something that my poor understanding and my little brain is unable to get. The counterweight system is something that has been used not only in F1, but even in modern construction of building and bridges. When designing skyscrapers a heavy weight is used to minimize the forces wind makes all along the façades and keep the building safe. Modern bridges uses the same principle to stabilize the roadbed (which has a cross section like a wing of a F1) so it works efficiently under windy conditions. Even the Concorde used weight (fuel pumped between inner tanks) to modify it's gravity center and maintain the required angle of attack, which was different for subsonic, transonic and supersonic speeds. So this wasn't new (in fact, it's a rare situation where F1 hasn't been innovative at all). And to consider this a movable aerodinamic system is like considering that Robert Kubica 8 kg thinner is a movable aerodinamic part. And now I keep ashamed that all of the teams have been succesful to do the same thing (maintain constant the angle of attack of the front wing) without using weights, and it is fine for the FIA. Isn't it enough irony???? That is a very good question, Ben, and I must admit that I haven't the faintest idea. Architrion seems to have some understanding of it so perhaps he could enlighten us. Fortunately, we don't need to understand the principle to follow the legal ins and outs of the WMSC hearings, however. I make the (perhaps foolish) assumption that what is sauce for the goose is sauce for the gander in that case. Irony upon irony indeed, Architrion. I did not see how Renault's dampers could be judged aerodynamic devices in 2006 and so it seems doubly strange that the J-dampers are quite legal. To bring the whole confused business up to date, however, it seems to me that such obvious legal favoritism is reason enough for Max Mosley to step down from his position and it is quite ironic that he has been the cause of his own downfall through matters entirely unconnected with dampers at all. That should be a bit of a damper on his parade, at least! I don't have the same knowledge on J-Damper that I have on the use of weights and how that applied to the mass damper system. In addition, my english won't help at all trying to explain technical issues. But I'll try the best that I can. The principle is that when one force is applied on the wing, this reacts with another force which equals its strength working on the opposite direction. The mass damper used weight and inertia to apply forces that worked in the opposite direction of the suspension and aerodynamic forces. This way the resultant vector of two forces with the same value (more or less) and opposite directions is near to 0. This means no significant modification on the angle of attack of the wing, keeping stable the airflow, keeping unmodified the thin layer that goes near of the surface of the wing, preventing the loss of the aerodynamic force, keeping it working near its max level of efficiency. I've read that J-damper uses springs and oil instead of weight and inertia. Oil is a liquid and liquids can't be compressed. But is a high viscosity liquid, so it's difficult to move inside a tube. I suppose that you can use the forces generated by a high vicosity liquid trying to move inside a tube when the car turns or the wing flexes, to neutralize the aerodynamic and suspension forces. How it's constructed I have no idea at all. It does make a lot of sense, Architrion, and I begin to see how a J-damper could be used. Thanks for that. I'm sorry if i have misunderstood all of this, but did'nt you said that Renault have gotten the idea to this damper-system out of documents aquired from McLaren through Mackereth? And they have openly admitted to have been using the documens?? How the hell can they then be allowed to be in F1 at all? Considering the amount of public disgrace and punishment thrown at McLaren last year, this makes absolutely no reason at all to my ears. An that FIA then had to have a special scrutiny of their car, just to see if there was anythin on it that could be developed with the knowledge from the Ferrari-documents. Hmm, i thought rules and regulations applied equal to everyone. With F1 beeing such a large business as it is, with thousands and thousands of people making their living out of it. How come that FIA can play around with it at their free will and adopting their rulings to each and every case as it fits them. I really don't get it. You are not the only one who finds the Renault judgement at complete odds with the McLaren verdict, Björn; Mosley attempted to excuse it at the time but his reasoning is so flawed that it makes no sense at all. You can read the result of the Renault hearing here and the McLaren hearing transcripts are at this address. That is a lot of reading matter but the most striking fact that emerges is the similarity between the two cases - for virtually every offence that McLaren were deemed guilty of, a similar but worse act is proved in the Renault case. Yet the excuse for not penalizing Renault was that the two cases were completely different. It is quite clear that both cases were driven by political agendas. This whole thing just makes Max look more ridiculous. McLaren are not allowed to use what they learned from Ferrari but Renault (and everyone else) is allowd to use McLaren technology. It's just one more reason why Max has to go, in my opinion, Steven. No international organization can afford to have a president running to his own personal agenda. Sorry Clive, i just have to lighten up my heart a bit. Is'nt it wonderful how things can turn out sometimes. Look at all the plants and stuff outside, holding their breath until they know the summer is coming and then they all spring to life and just scream at their release and give the world a whole new spectrum of colour. During the winter you can throw tons of snow at them, even lay a new layer of pavement. But at the springtime, they will still come out and show you their beauty. Waiting out all the snow, throbbing through the new pavement, growing and growing and nothing can stop them. If you try to hold them down, they will just wait until the right moment, and when you're not watching they will come. Ad the right fertiliser, and all hell will break loose amongst their roots and stilks. As you might have guessed, it's springtime here in sweden now, with birds singing in the morning and flowers all around. You could take the story as it is, but you are also welcome to make it into a Max Mosely-story. Springtime here in New England too, Björn, with similar sights and feelings. I have few seasonal writings to offer, a child of Africa (where seasons are so slight as not to be noticed) as I am, but here is something I can offer in return for your elegant essay. "Everyone thought that Fernando was going to save the team and Renault spent a lot of time and money to give him a good car," Fisichella told the official Formula One website. "In fact, in the first three races of 2007 I performed better with them than he has done so far this year." When I see the huge amount of money that they spent to bring Fernando back home, I understand that they can use it better in the J-damper development. If Becken's description of J-dampers is accurate (and it's the best description of them I've seen thus far), then the inertia of the oil attempting to enter the tube and the compression of the springs are how the device works. Both of these are movement manipulations, so the J-damper breaches Article 3.15 of the Technical Regulations, just as the mass damper did. However, I believe this discussion has so far missed the larger point: Article 3.15 implicitly bans every F1 car that has ever existed and some things breaching the Article (such as driver's heads) are implicitly required by other regulations. The justification for banning mass dampers was rubbish and now the teams are making advantage of the folly of the FIA's mistake. As for Fisi's statement, the thing about Fisi having done statistically better in the first three races of 2007 than Fernando in the first three of this year hadn't occurred to me until today. It made me smile, though, especially as I was one of the ones who thought Fisi and Force India would make a good combination. Admittedly, I thought Renault would be rather better than they have been so far, but still... ...especially since Force India (to the best of my knowledge) doesn't have a J-damper yet either!